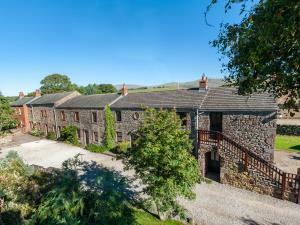 Milburn Grange Holiday Cottages Self-cateringNestling at the foot of the Pennines and enjoying uninterrupted views of the Lakeland fells, our comfortable cottages offer a high standard of accommodation and are open all year. The cottages, surrounded by gardens and pasture, are in the most relaxing of rural settings, and yet are within easy driving distance of the popular tourist centres of the Lakes, Dales, Hadrian's Wall and Scottish Borders. Milburn Grange is ideal for a relaxing holiday or short break at any time of the year. In addition, for those seeking an activity holiday/break there is ample scope for strenuous walks on the fells or a stroll by the river, some may be taken right from the cottage door. Cyclists may explore the Pennine and Cumbrian cycle ways, which pass by our gate. Some of the best game fishing in England is offered on the River Eden and nearby there are fishing lakes. Golfers will enjoy the challenges offered by the local courses and those a little farther afield, Keswick and Silloth. Appleby offers a grocery and butchers shop, a bakery, pharmacy, post office, garage, several traditional pubs, cafes, take-away food outlets and a bistro. The cottages can sleep from 2 to 6/7 people. All are centrally heated and 2 of the cottages have open fires. Cottages can be rented for a week or more from Sat to Sat during peak periods. Additionally, 2, 3 and 4 night short breaks from Mon to Fri and weekend breaks from Fri to Mon are offered all the year round except for Christmas and New Year. Our prices are inclusive of bed linen, towels and central heating. The kitchens are fully equipped, some with dishwashers and washing machines. A laundry is provided for use by all guests, irons, ironing boards, washing machine, drier. The resident proprietors are on hand if you need any help during your stay. All cottages and apartment are designated non smoking in-doors but your welcome to smoke outside Children welcome from any age. Milburn Grange Holiday Cottages offers weekly bookings starting on any day and sometimes short breaks. A 2-bedroomed cottage, 1 double and 1 twin. Open fireplace in living area. Fully equipped fitted kitchen. Price includes bath sheets and hand towels, tea towels and bed linen. Non smoking inside the cottage. Glorious views included. BramblesCottage offers weekly bookings starting on any day and short breaks of 3 or more days starting on any day. A 3-bedroomed cottage that sleeps 4 - 6 on 1 double, 1 twin and a bunk bedded room, adult size bunks . There is ample room for a Z bed for a seventh person and/or a cot. Large seperate lounge. Dishwasher and washing machine in fully-equipped kitchen..
Fell Cottage offers weekly bookings starting on any day and short breaks of 3 or more days starting on any day. A 3-bedroomed cottage that sleeps 4 - 6 on 1 double, 1 twin and a bunk bedded room, adult size bunks. There is ample room for a Z bed for a seventh person and/or a cot. Large seperate lounge. Beamed ceilings downstairs. Dishwasher and washing machine in fully-equipped kitchen.. Helm Cottage offers weekly bookings starting on any day and short breaks of 3 or more days starting on any day. A 2-bedroomed cottage, one double and the other with adult-size bunk beds. Open fireplace. Fully-equipped fitted kitchen. Holly Cottage offers weekly bookings starting on any day and short breaks of 3 or more days starting on any day. Only 20 minutes from the M6 jct 40. Take the A66 towards Appleby, turning off left at Kirkby Thore, Bridge End pub. After 2 miles turn left at the T junction then first right. Follow road to Milburn Grange.